Top tip: if you book online in advance you can get excellent discounts on entry to each attraction. It’s also important to check the attraction websites for their opening days and times as these vary throughout the year. In general, opening times and the number of rides that are open in the winter months is reduced but often so is the entry price. I’ve listed the websites below for your information. Planning a family break in the South West? Take a look at my big guide to holidays in Devon or family holidays in Cornwall. 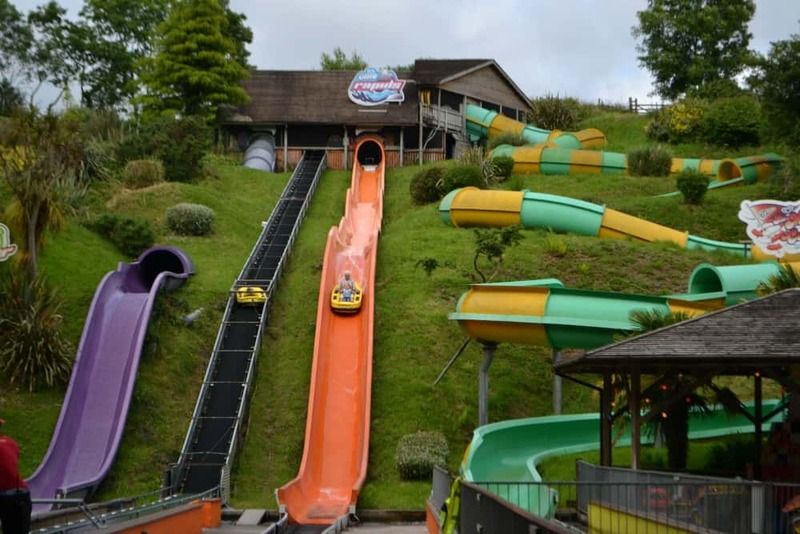 If you’re a fan of rollercoasters, log flumes and go-karts then Crealy Adventure Park & Resort near Exeter is the place to head. This award-winning family attraction has 60 rides, as well as a farm, adventure play grounds, a splash park and indoor play to satisfy kids of all ages. We’ve been visiting since the girls were three and one-years-old and have never been short of things to do. Some of their favourite rides include the carousel, the Flying Machine and, more recently, the Maximus rollercoaster. There are height restrictions on some of the bigger rides. Once children are over 92cm they can have a go on most attractions, but there are some that toddlers can do from 80cm high. You can also stay at Crealy. Its Crealy Meadows campsite has touring pitches for tents, motor homes and caravans, or you can hire one of the lodges or glamping tents. Entry to the theme park can be bought with your stay. We have season passes to Woodlands near Dartmouth and find ourselves there most weekends we are free; even if it’s just for a whirl around the Atlantis indoor play zone. Woodlands aces indoor play across the woodland park with several areas dedicated to slides, soft play and ball pits. It’s one of my top things to do on wet days in Devon. Outdoors my girls love the tractor ride, bumper boats, bouncy cushion and toboggan run. If adrenaline rushes are more your family’s thing then there’s the pirate galleon, three water coasters, the avalanche tray slides, and the Vertigo drop tower ride. You’ll not find rollercoasters here but there’s plenty of rides to give you a thrill. Height restrictions apply on some rides. Children over 92cm will find they can have a go on a lot of the bigger rides. You can also camp at Woodlands Grove next to the park and get free entry to the theme park during your stay. Woodlands Grove has touring pitches and a camping field. The Milky Way in North Devon is a superb choice for a Devon day out if it’s raining. Many of its attractions are under one roof that covers the same space as three football pitches. This includes fairground and thrill rides. Height restrictions apply to some rides but once your children are over 80cm there’s lots they can do. The Milky Way also has a dedicated soft play centre for babies and toddlers. Outdoors you’ll find rollercoasters suitable for the whole family, plus a train ride, Devon falconry centre and a huge tube slide. My girls love bouncing on the inflatable cushions and the craft centre where you can paint pottery. Visit during the main school holidays and there are extra shows for families to enjoy including magic, science and bird of prey demonstrations. 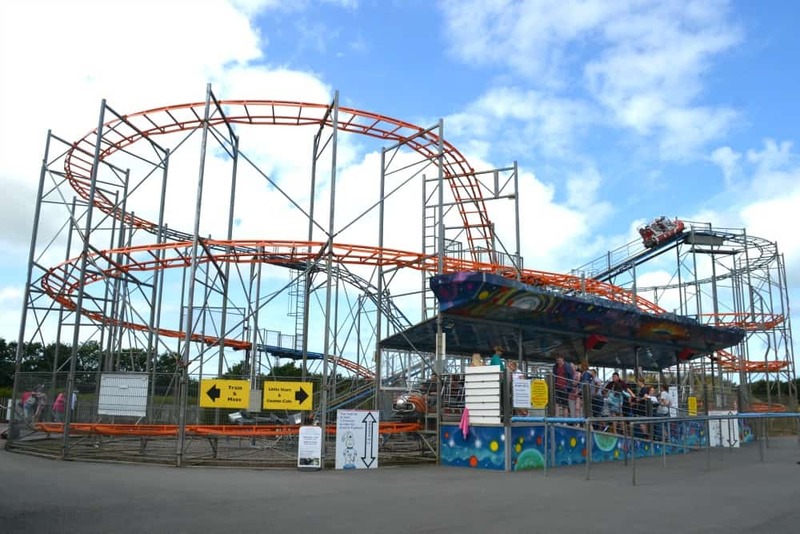 Visit this theme park near Bideford and you’ll find Devon’s highest and fastest rollercoaster. There’s also combat games for thrill seekers and a farm safari, pedals and a train ride for visitors who like to take things at a slower pace. Plus you can meet animals, see a show in the school holidays, dive into the indoor play area, and watch the fun sheep races. For more mature visitors there’s a micro brewery, gin distillery and festivals throughout the year. Take a look at The Big Sheep website to find out about its special events throughout the year. This theme park in North Devon has fairground rides and adventure play areas in the grounds of a Victorian castle. Inside there’s dungeons, a musical water fountain display and nostalgic collections of toys and period treasures. If your kids love diggers and tractors they will be in their element during a visit to Diggerland near Cullompton. Drive JCBs, go karts and mini Land Rovers, ride on vehicle themed rides and scramble around the indoor play area. If you’re visiting in the winter you’ll find plenty of festive activities happening at theme parks in Devon. You might also find my big guide to holidays in Devon or family holidays in Cornwall useful for planning your days out in the South West. Planning a holiday to Devon? Why not pin this post about theme parks in Devon for later?